(Bloomberg) -- Dominic Cummings, the director of Vote Leave during the Brexit referendum campaign, has been found in contempt of Parliament for refusing to answer lawmakers’ questions during an investigation into fake news. The Brexit mastermind, played by Benedict Cumberbatch in a recent TV drama, is known for his combative style. 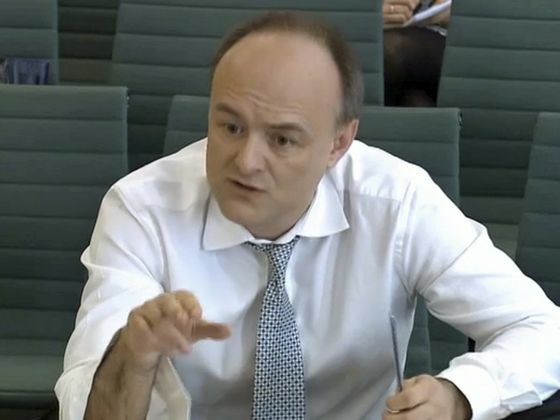 He repeatedly refused to appear before the House of Commons Digital, Culture, Media and Sport Committee, which wanted to ask him about targeted online advertising during the 2016 campaign, following allegations that private Facebook data may have been misused. In a series of heated email exchanges with the panel’s chairman Damian Collins, Cummings told him: “I will not participate in your theater,” and accused Collins of grandstanding. Parliament will now debate calling Cummings to appear before them to berate him. “His calculated behavior to draw out the process and defy escalating orders to attend demonstrated a total disregard for the authority of Parliament, and has now placed him in contempt of the House,” Collins said in an email. He called for clarity on the power of parliamentary committees to call witnesses. Penalties for being found in contempt of Parliament vary. Cummings, a former adviser to Environment Secretary Michael Gove, could be issued with a fine, although this penalty hasn’t been used since 1666. As a last resort, MPs could threaten to incarcerate him in the clock tower of the Palace of Westminster -- more commonly known as Big Ben -- a measure not used since 1880.